Prescott, AZ is known for its quaint downtown and abundance of outdoor recreation. Prescott, Arizona is a charming mountain town that provides a great lifestyle for active adults. With its stunning scenery, mild weather, and abundance of outdoor recreation, active adults can enjoy the best that Northern Arizona has to offer. Prescott’s quaint downtown area is also home to a number of cultural attractions and a vibrant art scene. Discover why active adults are choosing to spend their retirement in Prescott. Unlike some of Arizona’s desert cities, Residents can experience four distinct seasons in Prescott and even some snow during the winter months. And while temperatures regularly hit the triple digits during summer in the Sonoran Desert region, Prescott’s summers are mild. The average summer high is in the mid 80s. Fall and spring bring beautiful, sunny days in the mid 60s to 70s. No matter the season, Prescott is a great place to live for those seeking mild temperatures and seasonal variation. 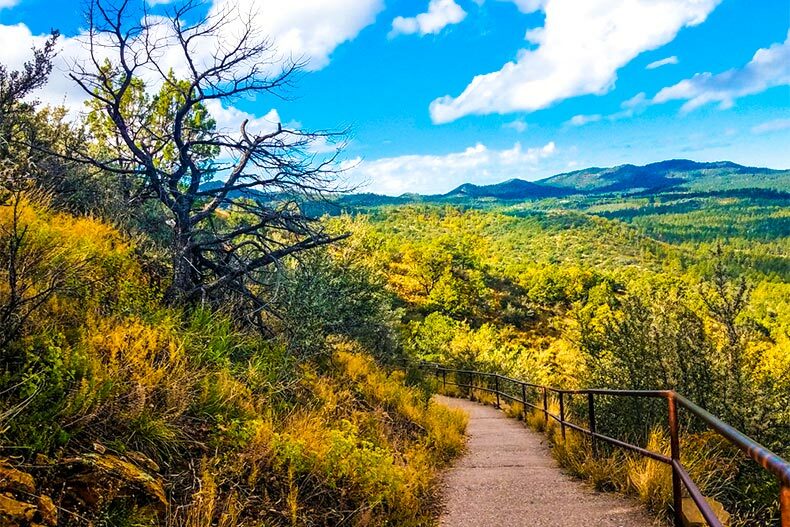 Prescott National Forest has numerous trails with scenic viewing points. The Prescott area is a haven for outdoor enthusiasts. Its great weather and close proximity to national forests make it easy to stay active outdoors all year. 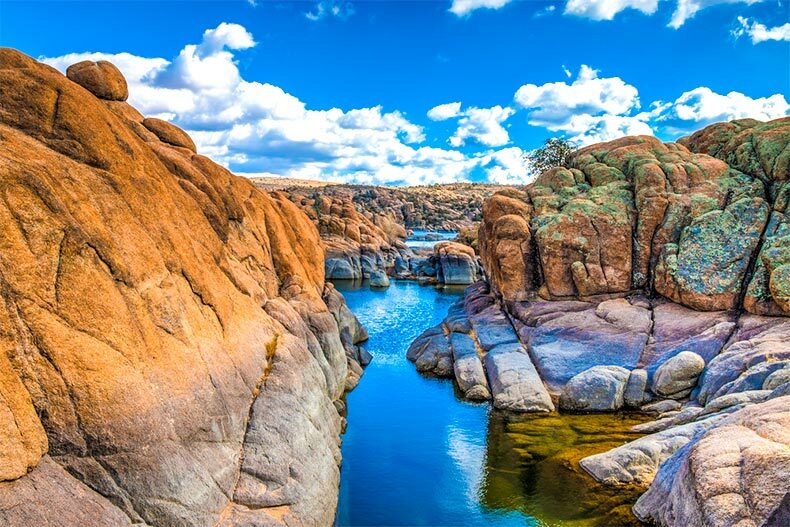 From hiking to kayaking, there’s always a way to enjoy the outdoors and admire Prescott’s natural beauty. The nearby Prescott National Forest has 450 miles of hiking trails and over 100,000 acres of wilderness to explore. There are also campgrounds, fishing areas, and world-class horse riding trails. Since 1888, Prescott has been delighting spectators with action-packed rodeo performances. This yearly event occurs every 4th of July weekend, and features bull riding, steer wrestling, barrel racing, team roping, and more. The event coincides with Prescott Frontier Days, which features a rodeo dance, parade, arts and crafts festival, and other Western-themed events in downtown Prescott. Prescott frequently appears on top 10 lists of the best art towns in America. With its fantastic lineup of art galleries, festivals, and other cultural attractions, it’s easy to see why. Film buffs will appreciate the annual Prescott Film Festival, which showcases independent works from internationally acclaimed filmmakers. Each summer, Prescott also holds a three-day jazz festival, which features musicians from around the country. From watching symphony performances to exploring local art galleries, residents of Prescott can appreciate art in its many forms. There are also plenty of local workshops and classes for those interested in honing their artistic side. 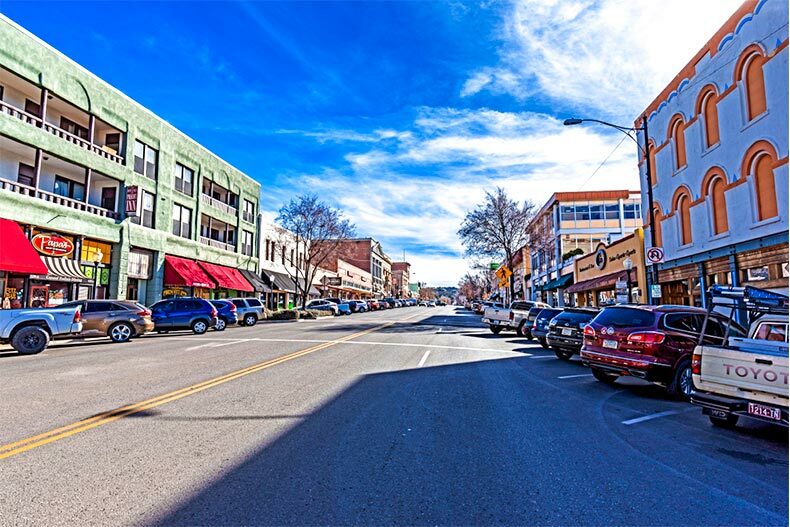 Prescott is nicknamed “Everybody’s Hometown,” and its charming downtown area certainly captures this sentiment. The focal point of downtown Prescott is its famous Courthouse Plaza, which has served as the city’s central spot for celebrations and special events for over 140 years. The historic buildings in this area preserve Prescott’s rich history as an old mining town. Next door is Whiskey Row, which at one point, had a total of 40 saloons. This historic block has been revitalized since the Gold Rush days, and now visitors can explore its art galleries, shops, and saloons. Prescott’s downtown area is also home to several buildings that are listed on the National Register of Historic Places, and there are great museums that allow visitors to take a step back in time. The state of Arizona is known as being fairly tax friendly for retirees. Social Security retirement benefits are not taxed, and up to $2,500 of military, civil service, and Arizona government pensions are also exempt. Property taxes are also relatively low. From quaint communities to resort-like developments, Prescott has an excellent selection of active lifestyle communities to choose. For buyers seeking an affordable option, Prescott Canyon Estates is sure to be a great fit. With just 255 single family homes, this 55+ community enjoys a tight-knit atmosphere. The community’s low-maintenance single-family homes are affordably priced from the mid $100s up to the high $100s. Residents here can stay active in the exercise room, take a dip in the indoor pool and spa, or explore the grounds with walking and biking trails. There is also a tennis court, outdoor patio, library, events room, and more. Hassayampa Village is a beautiful master-planned community featuring mature landscaping, two natural streams, and an on-site golf club. While it has no age restrictions, the community is a popular option for buyers seeking high-end active adult living. Upon completion, Hassayampa Village will consist of 660 residences. The current selection of condos, single-family homes, and attached homes are priced from the low $200s to the low $4Ms. Residents are served by a well-appointed clubhouse that offers 30,000 square feet of amenities. It has a fitness center, studio for aerobics and dance, indoor pool and spa, steam rooms, and more. Outdoors, residents have access to a swimming pool, tennis courts, basketball court, walking trails, parks, and an 18-hole golf course.